Hypoxic Training - Good, Bad or Just The Wrong Terminology? ~ Feel For The Water! Advice & Tips to Improve Your Swimming. Home » » Hypoxic Training - Good, Bad or Just The Wrong Terminology? Hypoxic Training - Good, Bad or Just The Wrong Terminology? You may have heard swim coaches use the term Hypoxic Training and wondered exactly what it meant. The literal definition means to swim with fewer breaths per length and so limit the supply of oxygen to your body. The traditional thinking was that oxygen deprivation helps promote your aerobic development - a theory we don't subscribe to at Swim Smooth. If you have tried a hypoxic set yourself (e.g. breathing every 5, 7 or 9 strokes) you will know that after a short distance you become quite desperate for air and things rapidly become a battle to abstain from taking a breathing for fear of invoking the wrath of the coach! But push too long and too hard during such exercises and there is a risk of blackout, which is obviously very dangerous indeed. This has been in the press recently here in Australia following a near-drowning incident with a junior swimmer during a coached squad hypoxic set, begging the question should you avoid all controlled breathing sets? We would say no... Our philosophy is that conducting controlled breathing sets over short distances for the purpose of technique development can be hugely valuable but we never deliberately target oxygen deprivation (or CO2 build-up) for training purposes. Compared to classical hypoxic training our sets give a much lower stress on the body. One contributing problem here is that coaches commonly refer to reduced breathing sets as 'breath holding' - which is very misleading (and possibly dangerous in its own right). As we shall highlight below, you should never hold your breath when you swim - you should always blow out into the water! up at the front and sinking his legs at the rear. Whilst an elite swimmer suffers a lot less from these issues, if any swimmer were able to swim down the pool without breathing in at all, they'd automatically side-step these potential flaws and so swim significantly faster and more efficiently. Going many strokes between breaths is fine if you're a 50m sprinter racing for less than 30 seconds but if you're swimming anything longer then breathing regularly is essential to take on sufficient oxygen. So how do we work to overcome stroke flaws whilst breathing? One key way is to swim short distances at moderate pace breathing less frequently, perhaps every 5 or 7 strokes. These are short enough to be perfectly safe but give you plenty of opportunity to learn good motor patterns without the distraction of breathing so that when you do go to breathe they are much more likely to stick. Note the key here isn't oxygen deprivation but stroke technique development over short distances. The use of fins (kicking gently) and pull-buoys may also reduce your oxygen consumption and make these sets easier to achieve. 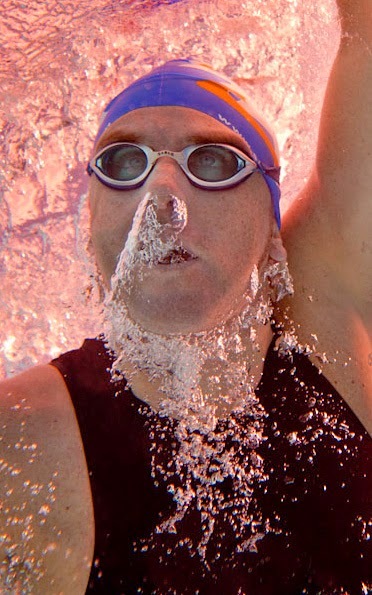 When you read information about reduced breathing sets, coaches often make the mistake of referring to them as being challenging because of their "breath holding" element. Ironically that is the exact opposite of what they should be - you should never hold your breath when you swim! Whenever your face is in the water you should exhale in a long continuous stream of bubbles, getting rid of the CO2 you produce. By holding your breath underwater the levels of carbon dioxide in the lungs and blood stream start to increase which triggers the urge to breathe in, a condition called hypercania. This can be very stressful indeed and quickly worsens with reducing frequency of inhalation. By exhaling into the water your CO2 levels immediately drop. either your nose or mouth. In addition CO2 is in itself is poisonous to the body with symptoms ranging from headaches to nausea to eventual black-out. Do you get a headache from swimming? If you don't exhale well into the water then it's quite possibility a CO2 headache. The problem with the term Hypoxic Training is that it has become synonymous with holding your breath underwater. We propose a change in terminology to call these sets Exhalation Control which accurately describes what they should be about. If you are breathing every 5 strokes you should exhale the same amount as you would over 3 strokes but exhale slightly slower to cover the longer duration. Whilst we're here, it's also worth mentioning that holding your breath underwater is bad for your swimming in another way. It increases the buoyancy in your chest which lifts you up at the front and sinks the legs. If you have a poor body position then the very first thing you should work on in your stroke is your exhalation technique. - Allowing you to develop good exhalation technique and appreciate how much air you have in the lungs to exhale. As we posted two weeks ago on the blog, breathing every two strokes is simply not enough time to exhale properly. - Allowing you to focus on aspects of the stroke such as alignment and the catch phase without being ‘interrupted’ with the process of inhalation. - Giving you time to recognise what a smooth, fluid stroke feels like and equally how inhalation interrupts that rhythm. - Bringing you confidence that if you do miss a breath during a rough open water swim, that you can simply complete another stroke and rotate to breathe to the other side without panicking. - Regaining your rhythm and focus in your longer, continuous swims when you feel you may be starting to daydream. - Just like in your normal stroke, never ever hold your breath - just reduce the rate of exhalation the longer you go between breaths in, maintaining a smooth steady sigh into the water. - Never be afraid to take a couple of extra breaths here and there - remember this is not an exercise in how big your lungs are but an opportunity to focus on elements of your stroke which would otherwise be lost to the interruption of breathing in. - Don't push yourself, literally go with the flow and recognise that by placing the emphasis on your exhalation you will feel much more relaxed. - Initially limit your exhalation control swims to 25m or 50m, resting between each for 15 to 20 seconds. - A classic exhalation control exercise to try is to rotate through breathing every 3, 5 and 7 strokes within a length or every 2, 4 and 6 strokes to your least favourite side. After the longer count you’ll really appreciate the brief drop back down to your normal pattern. - An exhalation control exercise only needs to be one more stroke than normal between breathing - you don't need to go crazy here. Even going from breathing ever 2 to every 3 strokes counts. - Use a Finis Tempo Trainer Pro set to your normal stroke rhythm and breathing every 5 or 7 strokes notice how you lose timing when breathing - either getting ahead or behind the beeper. This is much easier to discern that when you are breathing every 2 or 3 strokes. - Try using a pull buoy between your legs and see how that immediately makes the process much easier due to a reduced reliance on the large muscle groups of the legs to provide lift and push you forwards. - Using paddles (particularly technique paddles such as the Finis Agilities) will give you greater feedback on your stroke technique when breathing every 5 or 7 strokes. Use paddles together with a pull-buoy for best effect. Remember, when Swim Smooth recommends an exhalation control set we perform it over a short distance to work on your stroke technique, not to challenge your lung capacity or aerobic system. You shouldn't experience significant oxygen deprivation performing these short technique swims at moderate pace. If you have any medical conditions, always seek professional advice from your doctor before commencing. Stay safe and swim smart! Interesting article and wanted to add some thoughts. 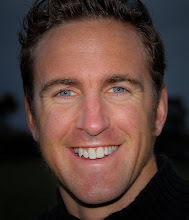 Am a medium-strong swimmer (1:35/100 pace) and triathlete who is equally comfortable in pools and open water. Generally breathe 3x4 or 3x3 depending on effort/pace. I do a pyramid drill (often in cool down, where I can go higher with less stress using a pull-buoy) where I start with a length of 2x3 and increase each length by 1, so 3x4, 4x5 etc. up to 8x9 which typically means one - two breaths in a 25m lap and then go back down again. I breathe out steadily in 3x3 and then start to hold my breath for the first 1-4 strokes before letting the air flow out steadily. I find building my tolerance to the discomfort makes it easier to miss a breath or two when swimming in large groups/rough water where periodically the air pocket you are looking for is replaced with water. Also wondered if by delaying breathing you train your body to utilize a higher percentage of the oxygen in your take in when you breathe. Great post. I find controlled exhalation is a great drill if you do it so it is *not* a strain. Go just at the pace where you can maintain it but stay relaxed and not run out of breath. This should force you to focus on your technique because you cannot afford wasted effort (=wasted oxygen). Also if you have any unevenness in your breathing this will help. You can gradually build up to longer distances or breath-intervals. Another stroke flaw that must happen from taking a breath, based on what happens to your body angle if you hold your breath, would be legs dropping low immediately after breathing in and leveling out as your lungs empty. Do we keep our body flat by adjusting our kick as the lungs inflate and deflate, or is the period too short and body angle doesn't change appreciably as our center of buoyancy shifts with each breath ? Learning to swim later in life seems to have me holding some breath for buoyancy as a coping mechanism for being face down in water. I find I'm less puffed after a length if I breathe every 4 instead of every 3, I assume the extra breathe out time improves my breathing by tricking my subconscious breath holding. Nonetheless I mostly breathe every 3 and chuck in the occasional 5. Is "hypoxic" training in the pool not good (with supervision) for teenagers to help increase lung capacity? Anyone have thoughts on using a swim snorkel as a part of a drill set to either work on form, increased inhalation resistance (say a cardio cap), or otherwise, as another way to incorporate reduced breathing in a workout? t5his information is old hat & only topical now because of the incident with the junior swimmer. The warning is much more applicable to the older Masters swimmer as hypoxic drills increase blood pressure & increase chances of stroke. Especially in open water in temperatures below 21 degrees when a diving reflex occurs.Coaches in masters swimming often spend more time on the competitive under 50s & less time on the over 65s. Good article and I like the foccus approach on exhalation and the different name. Someone in comments mentioned "does it improve your lung capacity" the answer is no. Your lung capacity reaches maximum at adulthood and is a limitation in increasing your VO2 max capacity. You can improve diffusion of O2, delivery and uptake through the muscles but ultimately the lungs become limiting. This is why the traditional idea of Hypoxic training does not work. It can improve your mental approach towards oxygen deprivation though. I emphasis this when doing Hypoxic once in a while but will now take on swim smooths approach of calling it exhalation control rather than Hypoxic. I agree and find that many of my triathletes and open water swimmers are not exhalling properly and am constantly working with individuals to improve this. The exhalation drill focuss is a great way to work on this. Thanks swim smooth. @Adam- Sounds like you're on the money there- keep up the good work! It's a very complex subject, but in a nutshell you need a lower percentage saturation of inspired oxygenated air to actually enhance haemoglobin levels and hence oxygen uptake (this is why alot of athletes will train at altitude). 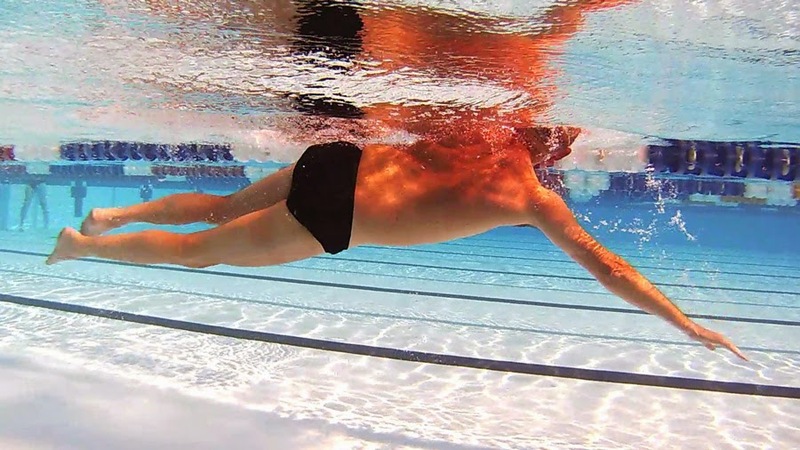 @Tom65- Yes holding your breath will definitely have a negative effect on your body position and sink your legs, we recommend a long steady flow of bubbles. Stick with what feels comfortable, I'd suggest keeping a bilateral breathing pattern though, e.g. B3/4/3/4s or B4/5/4/5s etc. Breathing out more will really help; you star to feel more relaxed in the water. @Anonymous2- See Alastair's comment below! @Anonymous3- Yes using a snorkel for short periods would have the same desired effect of being able to focus on smooth strokes without the interruption of breathing, but the action of breathing facilitates body roll which using a snorkel over longer periods can prevent. @Stuart Gray- Yes that's why we thought we would discuss it to help other swimmers around the world. @Alastair- Thank you, great answer too! Anonymous2- I'm sure some appropriate research will help you find your answer, I think you could argue either way. The point here is exhalation control rather than trying to maximise lung volume development.